Anthony Yarde‘s possession of his Southern Area championship belt was a predictably short-lived affair. The 25-year-old brutally parted the then champion Chris Hobbs from his status symbol back in May after four rounds that included four knockdowns. It represented a first professional title for the Ilford resident, who now holds a record of 11-0 with 10 KOs. It is clear, however, that Yarde is not the overly sentimental type who is set on saving his ring spoils for future generations of his family. Not yet, anyway – and not at the current going rate. Yarde though has already relinquished the title and was not tempted into purchasing a permanent piece of memorabilia. “No I think you have to pay for it, something like £1,000 and I wasn’t going to do that, not at this stage anyway. 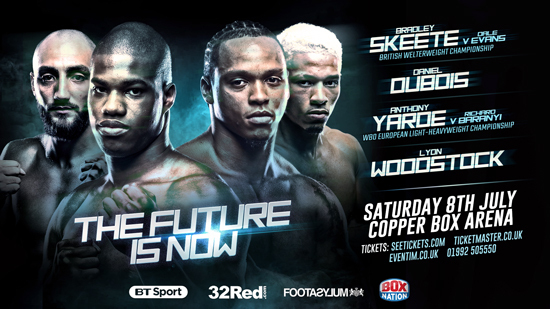 Yarde is back at the Copper Box on July 8 to challenge for the WBO European title held by the Hungarian Richard Baranyi, who is 18-1 with 12 KOs. It is one of five titles being fought for on the night, with Bradley Skeete making a third defence of his British welterweight belt against Dale Evans, Darryll Williams and Jahmaine Smyle rematching for the English super middleweight crown, Sam McNess challenging Asinia Byfield for the Southern Area super welterweight title, along with Gary Corcoran and Larry Ekundayo fighting it out for the vacant WBO Intercontinental welterweight title. Yarde remained in the dark about his next move until Frank Warren revealed all to the BoxNation and BT Sport audience straight after his demolition job on Hobbs. “I found this out after,” he revealed, although his close friend and trainer Tunde Ajayi was fully in the picture. “I am the kind of person who believes in his team so I left down to Tunde. He knew, but he didn’t tell me and I found out when Frank made the announcement after the fight on BT Sport. Yarde believes trainer Tunde is getting close to severing the apron strings that have kept his star pupil under close protection since he turned over in May 2015 with just 12 amateur fights under his belt. The light heavyweight thoroughbred will still not attempt to gallop before he can canter, but will stick to his abiding principal that he is in this game to entertain. “He is letting me loose, but I believe in teamwork and doing things together instead of separately. We move as a unit, a fist has a bigger impact than one finger and we trust in each other. “He trusts me to go in the ring and perform. There are so many trainers who put their fighters in there after they have looked fantastic in the gym, but when they go into the ring it is completely different and they can’t knock anybody out and don’t look exciting. “Then the trainer says they will take their time with him. “With me and Tunde it has been about not getting excited. Yes I have been knocking out people who, in my opinion, are meant to be knocked out. “When you are going four or six rounds with every opponent, I believe it is boring, it is not exciting. When fans are paying for something, I believe every fan would prefer to see a knockout or a stoppage, because that is what boxing is about. “When they see a mediocre fight that is boring, they will go and get a drink because it is not entertaining for boxing fans.